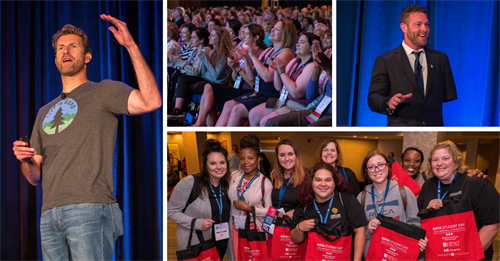 The AMTA 2018 National Convention in Washington, D.C., August 9-11, was a historic success filled with inspiration and positive energy from start to finish – it was the perfect way to kick off our 75th Anniversary! Relive the excitement from the AMTA 2018 National Convention! During Opening Session, Keynote Speaker, Bert Jacobs set the tone with his passion for optimism and giving back to others. He shared stories of the positive impact, Life is Good has had on the lives of many – especially children. He inspired the crowd to turn “have to’s” into “get to’s” – creating an attitude that can be used every day to view life through a lens of gratitude. AMTA President Joan Nichols shared the personal story of her massage therapy career and announced national award recipients. President Nichols also announced that AMTA will provide a minimum of $559,000 to the Massage Therapy Foundation this year. AMTA’s support helps MTF carry out its mission to advance the knowledge and practice of massage therapy through scientific research, education and community service. In addition, AMTA is proud to be the presenting sponsor of the 2019 International Massage Therapy Research Conference next May. This commitment is above and beyond what AMTA already gives to the Foundation. It is an important event that brings together researchers and practictioners to focus on the science of massage therapy. In AMTA’s Opening Session & Business Meeting, Executive Director Bill Brown announced that the Centers for Medicare & Medicaid Services (CMS), the federal government department that administers the Medicare program, issued guidelines that named massage therapy as a medically-approved non-opioid pain treatment alternative. AMTA is reaching out to nearly 700 Medicare Advantage plans around the country to educate them so that massage may be a covered benefit as recommended by CMS. To educate those decision makers and others, AMTA has published a document titled, “Massage Therapy in Integrative Care & Pain Management”. This informational tool is available online for download at: amtamassage.org/healthcare. AMTA kicked off its anniversary with a 75th Birthday Celebration in the exhibit hall on Friday evening. Attendees enjoyed cake, dancing to tunes, and exploring the various booths throughout the exhibit hall. Veteran Sergeant Noah Galloway, told his personal story and inspired the crowd with his humility, perseverance, and dedication, ending the 2018 National Convention on a high note. Sgt. Galloway brought the veteran’s voice into the discussion – which also included a panel of experts – Dr. Niki Munk, Nicole Miller and Dr. Chester ‘Trip’ Buckenmaier – who discussed the science and benefits of Massage Therapy for Military Veterans. View photos from the AMTA 2018 National Convention and download speaker handouts. 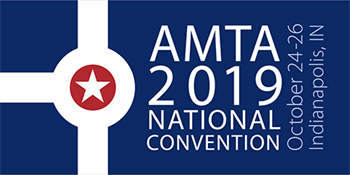 Attend the AMTA 2019 National Convention, October 24-26 in Indianapolis, IN. Join the massage therapy profession for continuing education, networking and products to help you succeed. Check back this spring for additional AMTA 2019 National Convention details!